Why is Website Antivirus a Necessity? On a daily basis, website antivirus checks your website for phishing exploits, malware, and several other common vulnerabilities. There are individuals who assume that they can only get a virus or malware infection by running unpatched software, downloading suspicious files, and visiting the wrong websites. All this is true, but these are not the only means through which malware can spread. A website antivirus is your final layer of protection. If a website uses a security flaw in your browser or a plug-in to compromise your computer, it will mostly try to install malware. Malware is presently considered to be the domain of organized crime aiming to collect financial data and harness a computer for botnets. Collecting such details will only cause damage to your website and even lead to complete business loss. This blog will provide you a few key tips on how to secure your website from the virus and go on to talk about the most effective way to secure your website from virus attacks. Your website will have to be secured in order to execute consistent updates for your WordPress plugins and also for your theme and WordPress core. However, you need to remember that WordPress updates can go wrong sometimes, and you could even come across the WordPress white screen of death or you might identify that your favorite plugin stops working after the update. Hence, it is a necessity that you perform safe updates. If you are using a shared hosting plan, it is better if you could upgrade to a managed WordPress hosting plan or a hosting plan that is more apt for business websites. Ensure to scan your website regularly for potential malware. A good scanning tool will allow you to scan your entire website for potential vulnerabilities, changed files, malware, and also check if your website has been blacklisted. You will also be able to see where potential vulnerabilities are because a good scan will flag website errors and outdated software allowing you to act on time and fix them before hackers take advantage of it. Maintaining regular site backups will help protect it against malware because a backup guarantees that you can rapidly restore your website to the way it was before malware infection. All backups will have to be stored offsite so that you always have access to them if your hosting provider gets compromised because of a power outage or security attack. Switching your website to HTTPS was once only needed if you had an e-commerce website. However, these days HTTPS is recommended for all websites unless you want search engines to display a security warning when someone attempts to visit it. HTTPS, the secure version of HTTP, makes all communications between a visitor’s browser and your website encrypted. HTTPS gets activated after you install an SSL certificate on your website. Website users will be able to identify HTTPS by a green padlock or a green bar in the browser’s address bar. Think about installing a web application firewall that acts as your first line of defense and monitors your website for known threats. The firewall will monitor all the incoming traffic and analyze it based on what information visitors are requesting, how they behave, and the geographic location. Furthermore, a web application firewall will also permit legitimate search engines and visitors and block suspicious traffic such as hackers and spambots. To make hacking difficult you should always have strong and secure passwords for all your online accounts and profiles. Refrain from using the same password or using one that can be guessed very easily. When talking about website security, you need to have a strong password separately used for your hosting account, your domain provider account, your WordPress dashboard, and any other account linked with your website. This should be followed even by all registered users on your website. Also, make sure to update your passwords and those used by other users on your website every six months in order to lessen the chances of getting hacked. 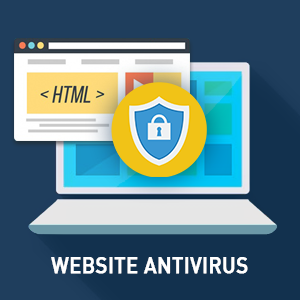 Putting together all of the above-mentioned tips, you now need one reliable and efficient website antivirus tool capable of giving your website all the protection it needs from hackers and several other web-based threats. Imagine a tool that comes as one whole package not just comprising of an antivirus feature but also including a WAF, vulnerability scanner, malware removal and prevention feature and several other unique web security features. A web security tool that can meet all these requirements has been developed by cWatch – a managed security service from Comodo, a cybersecurity company.